Patients throughout New York, New Jersey, and Boston have come to the specialists at True & Dorin Medical Group because they understand the diverse needs of their patients. Using the latest hair loss treatment options to address balding of various kinds, our surgeons can restore your hairline and give you a healthy, natural-looking head of hair. A number of questions have been asked regarding hair restoration surgery on African American patients. We'd like to look at some considerations unique to African American patients and why these are important to keep in mind when we develop hair restoration treatment plans. The nature of people's hair, scalp, and skin can vary based on genetics and ethnicity. Because of this, there are some unique considerations made when restoring the hairline of patients of different backgrounds. Below are some of the considerations made by hair restoration specialists when treating African American patients. African Americans have naturally curly hair, which is important to consider when harvesting the follicular units. The curliness of the hair does increase chances of ingrown hair and can lead to reconsiderations with regard to overall hair density in the restored parts of the scalp. Some African American patients may have a higher potential of developing keloid scars, which are upraised and rather unsightly. In such cases, it's important to consider the patient's medical history and explain all potential risk of these unsightly kinds of scars appearing in the donor area of the scalp. Just like the nature of the hair itself, the hairline of patients can vary based on their ethnic background. When determining how best to restore the hairline, the angle and position of the hair will be carefully considered to ensure natural looking results. 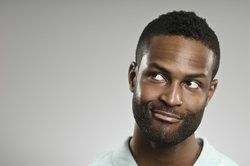 Does the hair transplant surgery differ significantly for African American patients? Even though special considerations are made based on ethnic background, the hair restoration surgery itself is basically the same: follicular units are harvested from the donor area (often the back of the patient's head where hair loss is unlikely) and placed in the area where hair is thinning or no longer present. Additional review of the patient's medical history will often be involved simply to ensure that risk of keloid scars and other visible scarring is low. During the consultation process, the team here at True & Dorin Medical Group will go over all of the risks and benefits of hair restoration treatment in full detail. This will allow patients to make confident, well-informed choices with regard to their options for addressing various degrees of balding. If hair restoration surgery would not be a good option for a patient, various non-surgical options can be discussed in greater detail. Ultimately it's important to us that each patient is able to undergo an ideal form of hair restoration for them. If you would like more information about hair transplant surgery and your many other options to deal with hair loss and male pattern baldness, be sure to contact our hair restoration specialists today. The entire team here at True & Dorin Medical Group looks forward to meeting you in person and helping you achieve the best possible results following restoration surgery.